As parents, dealing with a newborn’s sleeping hours can be challenging. By three to six months of age many infants have sleeping pattern, but may still have trouble sleeping on occasion. When a pediatrician’s recommended nighttime routines aren’t helping, you may wonder what alternatives are available to help your child sleep. 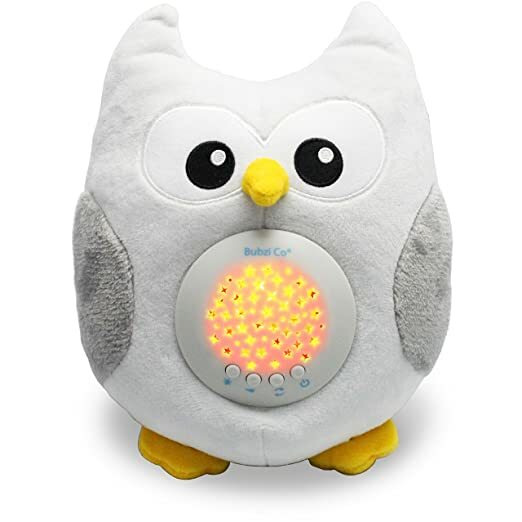 One of the most popular, effective tools is what’s called a “white noise machine” or a “white noise toy”- an affordable, simple product that help infants relax. But do they actually work? Unlike some sleep aids for babies, white noise machines not only help them fall asleep but encourage healthier, deeper rest. By now there’s scientific evidence that white noise decreases the crying durations and increases the sleeping durations of the colic babies. Even for adults, they’re a useful tool for meditation and stress relief. Let’s take a look at the science behind white noise machines for babies, things to avoid when using white noise for sleep, and which products you can buy to get the most value for your money. White noise is made up of different pitches and sounds blended together. Some white noise machines have settings that mimic sounds of the ocean, jungle, or rain. You can overlap the sounds to create a fuller, more diverse effect – it’s all up to you and what helps your baby the most. Whether white noise will work for your baby depends on their needs and preferences as an individual. For example, babies that commonly fall asleep in loud or crowded environments may respond well to white noise. If your child typically sleeps in a silent room, a white noise machine may interrupt their regular sleeping patterns. When you decide to try a white noise machine, it’s important to monitor how it impacts your child. Is it visible helping them calm down? Is it causing them stress? For many parents, it’s takes trial and error to find out what works best for their baby. Can White Noise Be Harmful? As a baby’s ears develop, they are very prone to damage from loud noises. Unlike an adult’s ear, a child’s are much smaller and more delicate – what doesn’t hurt an adult’s ear may cause irreparable damage to a baby’s. White noise machines are no exception. Although many brands produce white noise toys specifically targeted for infants, they’re still too loud when placed at a close distant. When a child is exposed to loud noises too often, it can lead to hearing issues later on in life. It can also lead to additional sleep disruptions, like any other loud noise. Dependence is another struggle for some parents who use white noise machines. Remember that white noise is not a cure-all for your child’s sleeping problems, but instead a temporary solution until you solve the root of the issue. Can White Noise Be Too Loud For a Baby? White noise toys advertise natural, risk-free relaxation, but there are things to look out for when using them with your child. According to the American Academy of Pediatrics (AAP), most white noise machines loud enough to exceed a baby’s recommended noise limits (50 decibels). To avoid harming your child’s ears with white noise, the AAP recommends setting the machine at least 7 feet away from them when they are falling asleep. At this distance, it should be loud enough to have an effect but not loud enough to cause problems. Do Babies Become Dependent On White Noise? If your child responds positively to white noise, it can be a huge relief. Who doesn’t love something that helps their baby nap? Unfortunately, using a white noise machine every time your child falls asleep can lead to dependence. It’ll help them fall asleep when the sound is present, but when your child is in a situation where they do not have white noise to fall asleep, it can cause anxiety and trouble sleeping. Be aware of this if you start using a white noise machine. When your child is with a babysitter or a family member, they may have trouble falling asleep without background sounds. Can White Noise Help Colic? When your child is diagnosed with colic, you may feel frustrated or hopeless. It may seem like there’s no way to help your baby, but for some children, white noise can help. White noise is thought to mimic the sound of a womb for babies, helping them relax and fall asleep. In the case of babies with colic, it can soothe them and help them stop crying. As already mentioned before there’s science behind the positive effect of white noice on colic babies and thousands of parents report their positive experiences using white noise for colic online, and some pediatricians will recommend it when other methods don’t work. Like any home remedy, white noise isn’t a guaranteed cure for babies with colic, but if you’re facing this problem haven’t tried it yet, it may be the solution. As always, speak to your baby’s pediatrician before you use a white noise machine to treat colic to make sure it’s a viable option. What Are The Best White Noise Toys for Babies? Adorable and effective, the Bubzi Co White Noise Machine is one of the best on the market. It comes with ten soothing lullabies and automatic off option so you can leave it on when you aren’t in the room. It’s battery operated, so you can take it with you in the car or to daycare without messing with wires and cords. This low-profile white noise machine is perfect for any room. It’s precious design (modeled after a baby chick) makes bedtime fun for your little one, making them the perfect sleepytime buddy. What makes the SleepyMe Smart Sleep Soother unique? In addition to its ten high-quality lullabies, songs, and melodies, it includes a starlight project that emits a beautiful night time scene on the ceiling! It projects stars in three different colors, giving your baby something to admire as they fall asleep. Want a portable, rechargeable white noise toy for your baby? Look no further than the SoundBub White Noise Machine and Bluetooth Speaker, one of the most advanced toys of its kind. With built-in Bluetooth capabilities, customizing your white noise settings has never been easier. The device connects directly with SoundBub’s VoiceShare App, where you can access 12 unique sound options (free with product purchase). Using Bluetooth, you can play your baby’s favorite songs or play a recording of your voice to help them sleep. All this technology is packed into one adorable toy, shaped like a friendly owl for your child’s enjoyment. 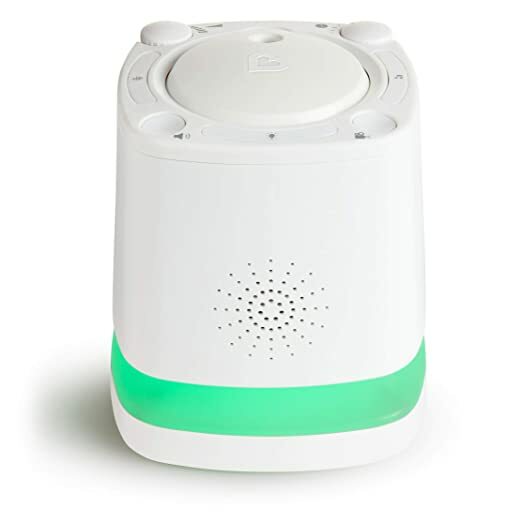 The Skip Hop Moonlight & Melodies Crib Soother is a simple white noise machine that’s perfect for any nursery. Its cute elephant design makes bedtime fun, and its built-in starlight projector makes it unique from other white noise machines. It comes with four built-in nature sounds and four lullabies. It doesn’t require batteries, so you don’t have to worry about it shutting off while your child is falling asleep. This white noise machine doesn’t offer a cute animal shape like the other toys on this list, but it comes with one major unique feature: a built-in projector. Using the projector, you can display a variety of fun colors and images on the wall to help your child fall asleep. It comes with three unique projector cards featuring images of the ocean, the rainforest and the sky. It also features an LED nightlight and a variety of soothing nature sounds.